A Limited Edition Seven CD Box Set. More than Eight Hours of music. "What if I forgot my guitar?" "What if there were no piano?" "What if I knew this was the last show I would ever do?" "What if I played only VdGG/VdG songs?" "What about songs I didn't play in Japan?" "What about songs I dropped from the setlists?" "What about the best alternate versions?" ...far too many songs to individually list here! Sorry, but we're now out of stock of this Box. Over the last decades it’s been my feeling that there should always be a CD release availabe which gives a picture of what’s been the main drive in live performance in the preceding period. Successively, we’ve had “Room Temperature”, “Typical” and “Veracious”. Currently occupying the slot - and likely to do so for the foreseeable future - is, of course,”Pno, Gtr, Vox”, released last September. As you’ll know, this represents a version of the guitar only, piano only shows with which I began my residence in Tokyo in 2010, with performances taken from the Japanese shows and also from the UK shows in the same year. A double CD is, I think, a decent artefact to leave out there as a (semi-) permanent exemplar of Performance. But while compiling the discs from all the available material it came to me that a specific, bigger, thing could also come out of the various shows. Hence, as the first Fie! 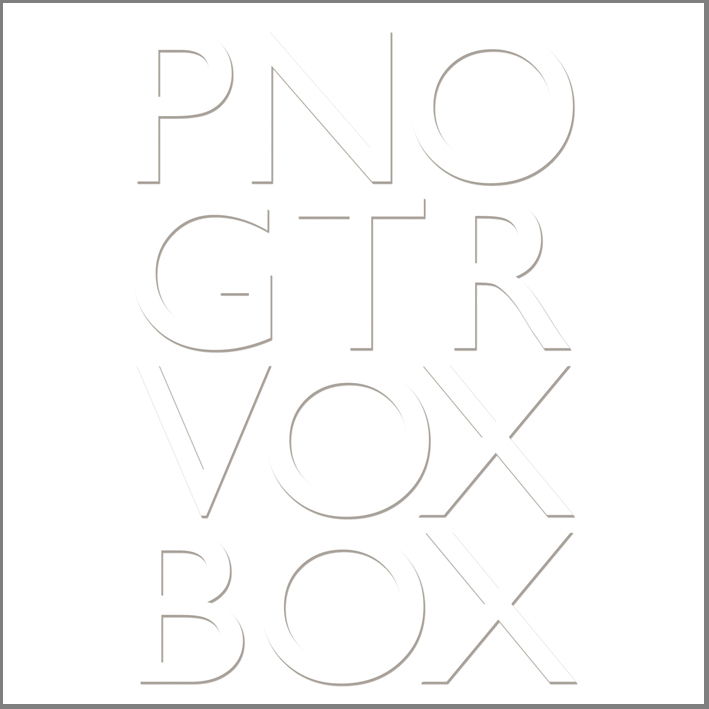 release of 2012, we have “Pno, Gtr, Vox Box”: a seven cd box set of live songs from the same sources. This project began with the assembly of the remaining two shows from the Tokyo stint: the “VdGG” show and the “What if I knew this was the last ever?”. As it turned out, the first of these was taken entirely from the evening at the Pit Inn...I simply didn’t play enough VdGG songs elsewhere for it to make sense to mix and match. Originally my intention had been to create a limited edition simulacrum of just the four shows. After listening through the various performances, though, I realised that the remit had to be wider. For a start there were a number of songs crucial to the current repertoire that I hadn’t performed at all in Japan. Cue Disc 5. And in order to get the timings down to approximately 70 minutes I’d had to drop certain songs from the original listings. Ecco, disc 6. Finally, there were various alternate performances which for one reason or another had simply not fitted into the flow of the first choice CDs. A final disc of alternate takes, then. There are over eight hours of performances in this box. Far too much to take in at one session. And, as before, it’s not definitive; it is, though, highly indicative of where I’ve been in my latest spate of live performance. There’s also, clearly, some kind of Retrospective Collection aspect here as well: the songs are stripped down to the bare essentials and cumulatively tell the tale of a career's worth of writing, recording and performing. The package as a whole, designed, as ever, by Paul Ridout, really is a classy piece of work. Each CD is held an individual wallet, featuring shots from my ongoing series of backstage photographs. A booklet with liner notes and full setlists and indications of which song from which show features on which CD completes the deal. OK, even though it’s a box set (all the rage, it seems, these days) there are no signed artist’s plectra or sunglasses, no fourteenth mix of the fifteenth outtake, no surround sound revisitation. What there is is The Stuff. And this one’s going to be strictly limited in edition. Although the Boxes are not individually numbered, I’ve taken the decision that the run will be restricted to the 2,000 which have been manufactured. Of course, something like this sells at a premium. But it’s been kept lower than some might expect and this particularly reflects the fact that, of course, the two CDs of the Pno, Gtr, Vox set - which many will already have purchased - are included in the set. Release date is set for February 13th. But of course we’re now taking advance orders.